I arrived in Penticton on Wednesday, which gave me plenty of time to have a relaxed lead-up to the race on Sunday. Mostly I hung out with my family (Theresa, Lana, and Danny our Corgi) and relaxed. The perfectionist in me wants to churn over goals and times and all the rest in minute detail, but after four Ironmans I’m pretty much over getting too worked up beforehand. Like I told Mark “TheFog” Moody at the race expo, I do these for fun and I try to keep it that way. I checked in early Thursday (20 minute wait) and poked around the Expo for a while, then we walked Main Street. We made some dinner reservations, poked in some shops, and had iced coffee at the Bellevue Cafe. Then we returned to the hotel to relax before the team dinner at the Lakeshore Resort. We had a pleasant evening of conversation at the team dinner, sitting with Mark, Logan and Shannon, and Eve and Kevin. I enjoyed the “go around the room introducing yourself” part; there were 16 of us in the race and I actually didn’t know everyone. Friday morning I was up early for a swim in the lake with JFT2 friends. The water was warm for the 20 minute swim. I like the atmosphere in Penticton at IMC – lots of nervous energy in the air but most people are fairly relaxed. And Danny (now 3 years old) enjoyed playing in the sand and getting petted by everyone young and old. I rode the bike course with a few JFTers (Rachel, Jess, Steve, Anne, and sorry I think I missed one or two of you) Friday afternoon and it was beautiful. Perfect weather, good company, good pace. Rides like that are why I like being a part of the JFT2 team. Saturday was about cleaning my bike, putting my bags together, dropping things off, and staying relaxed. We downtown for a while and had lunch at the lakeside restaurant (the Barking Parrot). I had a massage while Theresa and Lana walked downtown, then later in the afternoon I enjoyed a swim in the hotel pool with Lana. In the evening I built my race plan. My nutrition plan was the same plan I’ve used in the past – CarboPro mixed with Gatorade Endurance, electrolyte capsules (Thermolytes instead of Saltstick), a GU gel one per hour, and on-course GE and water. I switch to cola on the run and mostly skip the Gatorade. Late in the evening I figured out my goal times based on past performance as a 1:25 swim, 6:25 to 6:50 bike, and a 4:20 to 4:40 run plus average transition times. This gave a target time range of 12:21 (all three are great) to 13:10 (all three are average). I decided to be happy with anything sub 13 hours. Race morning was peaceful. I had slept well and was up at 4:45am for my morning shower and coffee, got dressed, and we left the hotel at 5:45. Staying at the Super 8 on Main Street meant that was closed on race day, so we went the back way via Government Street (as per prior planning) and it was super easy. Once at the race start I dropped off my special needs bags, put my nutrition and electronics on my bike, and was ready to go. I seeded myself on the far left because I didn’t want to get kicked around too much in the swim like last year. I saw Michael, Jill & JFTer’s (way cool! ), talked briefly to Mark, and boom the cannon was off and I was wading out. It seemed like a long time I was wading, and soon after starting swimming I was getting hit around pretty good. There was one guy who kept head butting my side, and then in the span of 30 seconds I had been head butted from the right, slapped in the face from the left, my ankles grabbed from behind, then my right arm hooked and my head dunked while breathing so I choked badly. I had a panic reaction right then – I was incredibly hot, I couldn’t get any air, and a little devil in my head screamed “GET OUT NOW”! Taking a DNF even crossed my mind but that was so WTF it snapped me back to reality so I just treaded water for a bit and did a couple backstrokes to get going, then back to a crawl stroke. After that I found some good drafts, rounded the turns well, and turned in my second fastest IM swim. I was pleased overall, but I would have had my fastest IM swim without that 3 minute panic attack. Grrr. It was cool seeing Kevin Christian in the transition – we got out of the water about the same time. My plan here was patience, go easy, and kick it in at the out-and-back. I felt smooth and steady, and kept an easy low-wattage pace to Richter. That climb was uneventful, and it was great seeing all the JFTers – Jeff, Anna, Rachel, Judith – and the JFT support van folks waved out the window. The descents and rollers were uneventful, and then I started hitting it harder leading up to special needs. One problem was that they didn’t have Gatorade Endurance on the bike – they had regular Gatorade which I find sickly sweet and I hate hate hate Orange. I was drinking more on-course water than Gatorade but otherwise following my usual nutrition plan of a fuel bottle per 90 minutes (two scoops CarboPro, two scoops GE), and taking two Thermolytes per hour, and the occasional gel. The ride was steady and my plan was going well. I saw Anna, Rachel, Jeff, James and I think one or two other JFTers. On the climb up Yellow Pass I started to get nauseated – pretty sudden onset. I stopped at the top of the descent to retch, but managed to bring up only a little and only felt a little better. Yuck. Time wasted, and I still felt crappy and sloshy inside. A nearby medic came over to check on me, and his advice was that my stomach had stopped processing fluids due to sodium depletion, and I needed to get salt in by sucking on pretzels or the like – no fluids, no food in my stomach because that would make it worse. He pointed out I was covered with salt residue from sweating which hasn’t happened before. I told him my nutrition plan, and he said in his 10-Ironman-finisher experience that I was overhydrating and under-electrolyting, which seemed reasonable. Anyway, I started riding again and pushed it fairly hard but I didn’t feel strong and was still nauseated. My 6:52 was just past my upper goal so I’m still pleased with that. In T2 I needed to pee, and I noticed it was medium brown in color – meaning I was in ketosis (burning all fat, no carbs) and pretty much “bonking”. My run plan was an under-10 minute pace to meet or beat 4:20. No walking except the steepest parts, determined by a low pace and a rapidly rising heart rate. 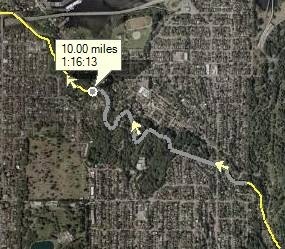 The first few miles flew by at around 9:45 per mile, and I was feeling better so I was hydrating a bit with crushed ice, a little cola, and some water, and sucking on pretzels for the salt. Each time I had fluids I felt worse for two or three minutes, then it would pass. If it lasted longer, I’d reduce the next fluid intake, if it was short I’d increase. I probably had 20-30 ounces of fluid in three hours – less than half of what I would normally have in that heat. The out and back nature of the run lets you see a lot of people you know. I saw a number of JFTers. Mark was going the other way running strong and waved hi as I was going up an incline, and Shannon was right behind him (it must have been just after he passed her). I saw Kevin, James, Jeff, John, Judith, and Rachel all running their race. We all exchanged “Go JFT” and “looking goods” and had fun. Pace-wise, I hit 6 miles at 0:57, then 12 miles at 1:57 (meaning my pace was dropping slightly), then was quite surprised to hit mile 18 at 3:08 – way off the pace. Looking at the my GPS data now, you can see that the combo of low energy and walking the steep part of the hills hurt my pace badly: mile 14 – 17 were 10:25, 14:17, 11:27, and 13:12. Right then I decided to go for it – eat a gel, down two colas, and kick it as hard as I could. I’d either completely blow up, or make my time goal. Thankfully it worked– soon enough I felt much stronger and my pace returned to the upper 9s. All through the run I kept thinking I was going to come right down to the wire for a sub 13:00 finish. At mile 18’s 3:08 I thought I’d probably miss it by 3 or 4 minutes – probably too much to make up in only 6 miles but I had to try. I didn’t know really what time it was in relation to the race start. While I had my Garmin, I had not synchronized it to the race clock and I only wore it during the run. At least I could make this my “2nd fastest Ironman” which means beat 13:08. Around mile 22 I was feeling good and felt that was close enough in that I could “bring it!” to make the finish line and poured it on. I was passing many runners as I ran up Main Street in the low 8s. It was great to hear the cheering and “looking great” etc from the fans. One of the best things about IMC is the incredible fan support. I always make a point of giving high fives to every kid with their hand outstretched, even if I have to slow down (or even bend down) to get them all. I high fived more than a dozen kids in those last few miles. Before long I was running past the cheers of my fellow JFTer’s on Lakeshore Drive, grabbing a drink at the last aid station and making the last turnaround to run past them again. That’s when I was stunned by Jill yelling “you can still make 13!” Thanks so much Jill for saying that, because although I thought I was running as fast could, I dug deep and found a little bit more. I could hear the announcer Steve King saying something like “Let’s cheer everyone in for a 13 hour finish – 2 minutes to go!” All I could do was run toward the finish line as hard as I could hearing him count down “90 seconds to go”, “less than a minute to go”, then “30 seconds”. I passed three or four runners and the crowd was really cheering but I could barely hear them over the sound of my hammering breath and pounding feet. My Garmin says I did the last quarter mile at a 6:57 pace with an average HR of 189 and a peak of 197, which must have been right as I entered the finish chute and knew I had made it. I ran the last few yards with my arms overhead in victory, and broke the tape at 12:59:46, falling onto the catcher on the other side. She got me standing and walking and I saw my fellow JFTer John Marquis just a moment later and screamed “I made it!” I knew he was a finish line volunteer and I was so happy he stuck around after his shift was over. Thanks John! I also saw Theresa and Lana on the other side of the barricade and I was so happy that they had seen my “big finish”. John and another volunteer helped me walk around, and I wanted to talk to medical about my ketosis problem. I got their advice to get some chicken broth in me, and get fluids starting but to sip constantly rather than gulp in large amounts. The volunteer brought me some broth and we chatted for a while, mostly me prattling on about how my race went. The broth was incredibly good (meaning I really needed the salt) and I was also sipping a water bottle, and within a few minutes I felt good enough to make my way over the pre-arranged meeting spot where Theresa, Lana and Danny waited. It’s been a while since my last post (understatement!). At first I didn’t post because I was busy, then after IMC last August I didn’t want to write about it for a while. It took me a while to make peace with my performance and then this long to get around to blogging again. I enjoyed blogging back when so hope to continue. Ironman Canada 2008 was a tough event for me. I had a good swim, died on the bike, experienced dejection and chilling rain on the first half of the run, then came back a bit on the last half of the run. Overall time was 14:09:53, which is my slowest Ironman out of four. Again I learned that there are no miracles on race day – you get the race you trained for, minus whatever trouble comes your way, plus whatever extra you can give on race day. I was undertrained on the bike, and that’s the race I got. After the Lake Stevens 70.3 in July, it was clear that my run and swim were OK (if slow) but my cycling speed and strength were woefully beneath what I needed for the hilly, 112 mile IMC course. I kicked it in gear (pun intended) and did a couple of ~100 mile rides (generally flat to rolling), 1 hour hill repeats on Lakemont Blvd, and some 50-60 mile hilly rides. I was hoping that would be sufficient to get the job done. The event is in Penticton, BC and this was the 26th year. The town goes all out for Ironman Canada. Every B&B, hotel, motel, etc. fills up, and it’s tough to get a place. Theresa had booked Lana and I in a B&B about 20 miles up the east side of the lake in the Naramata area. About two weeks before the event Lisa decided she wanted to go along, so we three left early Friday morning in order to make the athlete-checkin-and-packet-pickup cutoff time. It’s about a 5 hour drive and we went straight to the Okanagan Lake race venue and checked in, then headed to the B&B. It turned out there was a mix-up with the reservations and such – no kids allowed, and only two people to a room. I had to negotiate around that for a while until the owner of the B&B let us stay. Note that when you negotiate a place to stay in a town with every B&B, hotel, and motel full, you’re pretty much at the mercy of the kindness of strangers. So we were not off to a good start. Also Naramata may be 20 minutes away, but every twist and turn on the road causes a slowdown so we were 40 minutes out of town. Saturday morning we went downtown to check out out race expo. I saw a number of people I knew from JFT2 and from the local racing scene. Then we had some breakfast at Tim’s before I took a short 3 mile run around downtown while the girls checked out the street festival that was setup on Main Street downtown. Next we drove the bike course so I could get a sense of what I was going to do the next day. The bike course through the valley is exceptionally beautiful – even my daughters thought so. A far cry from the Arizona deserts where I’ve raced my other Ironmans. The hills didn’t seem to bad. Richter Pass had been rumored to be a killer, and while it look long it wasn’t steep. Eminently do-able. I was surprised by the size of the hill later in the course. They weren’t the “rollers” I had heard about (although there are plenty of those), there are out-and-out hills especially approaching Yellow Lake. Sunday morning we headed down to the race start and managed to get there early enough to find a fairly close in parking space. I almost DNFed before I started when I handed my car keys to Lisa, said my goodbyes, and then headed to the race start as the girls went off to find some breakfast. THEN I realized my wetsuit was still in the car! Five minutes of chasing back after them before I lucked out. Note to self: race day checklist! At least I could call that event my morning warm-up run. Soon enough I was standing in the knee-deep water of Lake Okanagan, waiting for the starter’s cannon. I was confident about the swim and the run, and the bike would be what the bike would be. BOOM! and I was swimming! The swim is an out-and-back affair, clockwise which is good for me since I breathe to the right and could see the buoy line. The swim was fairly violent. A lot of thigh slapping, foot slapping, and side bumping. At one point I was drafting pretty well behind someone, and suddenly his feet disappeared in the murky water. I was wondering “What happened?” just as he kicked me hard in the face – he had switched to a breast stroke to sight and I had caught up too close. I have never been kicked so hard before. Just shy of starting a nosebleed. Great. I was out of the water in 1:25, which was about what I hoped for based on training. My day was looking up! T1 was uneventful, and soon I was flying out of town on Main Street. The bike course is a single loop, which I’ve never done in a race so I was looking forward to that. My speed out of town was high, my wattage was good, and the start of the race is slightly downhill. I did manage to see Lisa and Lana at the pre-arranged spot on Main Street as I zoom zoomed past. All was well for the first 30 miles, then hmm I started to feel an old familiar pain in my left knee. This pain has plagued me on and off for years ever since I injured it in training years ago. It’s a deep dull throb and the only while-riding cure is IT band and calf stretches. I hadn’t felt it in months though, so I was stunned that it was back now at the worst possible time. At 40 miles I stopped to stretch it, burning valuable clock time. I would continue to do that every 15 to 20 miles, so I probably spent 20 minutes off the bike just stretching my legs. Richter Pass was a good steady climb, with the hot sun on my back and many cheering supporters lining the course. This was the best part of my ride by far. The descent into the valley was fine, and now I was starting to feel my thighs along with the knee ache. More stretching, and I dropped my effort level down to 150-160 watts since I knew there were hills yet to come. The valley has rolling hills, and each one took a little more out of me. At the midpoint there is an out-and-back loop off the main road to get to the special needs pickup at the 60 mile mark. This is only a few miles, but it was remarkably tiring. The road is rough, the sun was hot, my knee hurt and my legs were tiring. The special needs is at 72 miles, and I was pretty dejected at that point in the race. So for the first time ever in a race I just stopped, ate my food, rested a bit and stretched. I spent about 12 minutes off the bike at special needs preparing myself for the last 40 miles. I left in better spirits and resigned myself to a slow hard slog back to town. The climb to Yellow Lake was the final straw for my legs. I had done 60 mile hilly rides, and I had done 100 mile mostly-flat rides, but here I was at the 80+ mile mark climbing a tough hill. And then on the descent – my reward for that climb – was that it started to rain heavily. The long steady downhill into town was an exercise in speed control. I wasn’t one of those nuts flying down the hill pedaling hard. Instead I was coasting near the shoulder. Soon enough I was back in town with a total bike time of 7:27 at an average speed of 15 mph. I was hoping for 45 minutes to an hour shorter. But you get what you train for, and so it goes. T2 was uneventful although a bit slow as I stretched out my legs for the run, then off I went at a slow pace getting my legs used to running. The run course is an out and back along most of the bike course, down to Okanagan Falls and then back to Penticton. There are several fairly steep hills on the course which I planned to walk. The rain was lightly falling and I was chilled in a short time. I wasn’t dressed for this weather. I had thought Penticton in August would be cooler than Arizona in April, but I never thought it would be cold, and yet cold it was. I must admit even though my time on the bike had been slow, I wasn’t motivated to try to make it up on the run. Running is usually my strength, but I was experiencing my first emotional “low low” in an Ironman. I walked a couple of hills that I could have jogged, telling myself I was “saving my legs” for the run back. No, not really. My salvation came at the turnaround point, where a friendly couple was handing out used clothing to anyone who needed something. I took a dark blue long sleeve T-shirt, and with that I no longer felt chilled. The emotional cloud was lifting, and I was no longer feeling that low-low. I had no medical issues after the race. My knee was fine, my legs were acceptable, and I was happy that the damn thing was just done. I found LIsa and Lana, who had watched me finish from the stands. I found some pizza and some fruit, and finally found the girls. They say that the race venue isn’t super spectator friendly – lots of barricades to keep the spectators off the course, so lots of long distance walking to get to the designate places to cross. My last surprise of the day was next. The girls had spent time in the SUV reading and staying out of the rain, and the story was: ”Uh, Dad? I know you told us not to, but we turned on the lights so we could read, and now we think the battery is dead.” So my post-race time was spent calling CAA and waiting for a jump, and that took long enough that all the restaurants in town had closed. Monday was more fun. We slept in, then packed up and had a very pleasant and leisurely brunch on the outdoor patio restaurant at the Lake City Casino, next the race expo. I signed up for IMC 2009, said “Hi” to a few people I knew, and then we drove back to home. On the way back we took the route down to I90 which was much faster than the Stevens Pass route we had taken to get to Penticton. I’ve done all the routes (north to Vancouver then east, Stevens Pass, and I90 then north) and the I90 route over Blewitt Pass is clearly the best way to get there. Yesterday I raced the Expedia Lake Stevens 70.3 Half-Ironman race, my first race since IMAZ last April. But first I need to get my excuses out of the way: basically I've been working a lot since IMAZ in April, my daughter graduated high school, and my house is being remodeled. So I haven't done a lot of training - some swimming once or twice a week, a long run on the weekends, but I only rode my bike three times since April, and that counts my 14 mile roundtrip to work once. I approached yesterday as a training day more than an actual race. I have IMC coming in August, and I needed find what I need to work on, and most of all I needed to avoid injury. I had a good race, with a slow back-of-pack time but that's about what I expected. I had one bad calf cramp in T1, but overall that had less of an effect than I feared. I also enjoyed the race a great deal. The JFT2 team was there in full force, in our cool team kits. My race plan was to swim steady (as always), to average 150 watts on the bike, don't exceed 255 on long hills, and then on the run I was going to do 160-165 bpm. For nutrition I had two bottles of Carbopro with 4 scoops each, one with Gatorade and one with water. I planned on using on-course water. The Lake Stevens venue was pretty much the same as last year. The swim is in the lake, the bike is a two loop affair on local country roads still open to traffic, and the run is a a double loop of an around-downtown course with a loop on one side of town, and an out and back along the lake. Lake Stevens is about 30 miles from Bellevue, so it's easy to get there for me. I drove up in the morning with my wife, three daughters, and of course Danny our corgi. The day was cloudy and raining in Bellevue, and to be honest I was a little ticked off by the weather. It's been awful all spring, and I just haven't wanted to go out and bike in it. And now it's July, I have a race, and it's still raining? Arrghh! Anyway, it was dry in Lake Stevens and while not exactly summer weather, pretty good weather for a triathlon. The swim start is an in-water wave start by age group, next to the boat launch. I skipped the in-water warmup beforehand because there's no good place to do it; I learned last year the little area next to the dock is full of underwater rocks and logs. I wanted no injuries from that. So at 6:44 I was in the water. I was wearing my wetsuit, and the water was warm at 72, but not too warm. I saw Jill just as the starting horn sounded, and off we went! Well, in about 300 yards I found my goggles were leaking, so I had to stop and adjust. I had to do that twice more before I cured the leaks. The rest of the swim was uneventful, except that I over-turned the second turn and swam 50 yards into the center before being waved off by a kayaker. In T1 though I had a massive 60 second long cramp in my left calf. I was taking off my wetsuit, so I was on the ground with it all around my feet and BOOM I was cramping and was pretty much stranded. I hoped to just let it go away, but after 20 seconds it was obvious it was there to stay. I tried to stretch it out, but by the time I got my foot free of the wetsuit one of the volunteers was there to help. He did the push-my-toes-toward-my-knee bit, and the cramp worked loose in a few long, long seconds. Now I was completely off my game, and futzed around getting my wetsuit the rest of the way off, getting my helmet, etc. Eventually I had my bike off the rack and took off through the bike exit, waved at my family, and then at the first turn in two blocks I was actually stopped by a volunteer and told to go back and get my race number! Arrgh! I rode back, saw Jill and had her hold my bike while I ran back to the rack to get my race belt. I saw later that many, many people had no race number on the bike. After retrieving my bike from Jill I was finally out on the course again. The bike course is an up-and-down through rollers with a few actual climbs. I had a good ride, staying at my fairly conservative power output goal. The power meter shows my average was 149, which was right at the number I wanted. Nutrition wise I was OK; I had planned on using on-course water but there was only one aid station near the end of the first lap (not near the beginning like I expected). So my food mix was a bit undiluted until the second lap. My left calf bothered me at times, and my left knee started to have pain by the middle of the second loop. I'm sure this was a side-effect of the calf problems. And of course my neck and shoulders hurt from staying aero for 56 miles. At one point I found a referee alongside me, and heard him say "What you're doing is drafting" and since no one was ahead of me I was surprised. But then I realized he was talking to the wheel-sucker sitting behind me! I hadn't noticed him, but Jurgen the head coach did. And he got the red card for a four minute drafting penalty. The guy actually argued for a moment, saying he was "part of a relay" and "not competing". Jurgen would have none of that; as he said at the pre-race briefing "arguing won't work, once we're talking to you you're getting the penalty". The last 10 miles of the bike I was starting to tire. My neck hurt, and my calf hurt, and the hills seemed one-after-the-other (gee, that's because they were). I longed for a clear flat straight stretch, but that's just not Lake Stevens. Back in T2 I futzed around re-racking my bike. The people around me seemed to leave quite a mess, and I was one of the later people coming back in and getting my bike in place among their bikes wasn't all that easy. But them's the breaks when you're slow. I switched to running shoes and hat, grabbed my gels and Saltstick capsuls, and off I went. The run starts with a two block section out of the finish area, and I saw my family. High-fives all around, and I told them I was doing great and I'd be done in around 2 hours, one hour for each loop. The first loop I had some quad cramps same as last year, and I was confident they'd be gone after the second mile. At the first aid station I took two Saltstick capsules, ate a Gu, and had a cup of water and a cup of Gatorade while walking the station. That's a lot, but it was a bit warmer than I expected and I needed to fuel and hydrate. I did that at two more aid stations, plus I alternated water and Gatorade at the aid stations. I had a great time on the run. I really do enjoy running, and I just ran it like a long training run. I was pushing myself a bit to the 165 HR mark, but since my calf and knee were still in pain I didn't want to push it too far. I remember my injury back in Arizona last January, and wanted no part of that this year.I cheered every JFT team member I saw (and there were a lot! ), and I chatted with the occasional racer as I passed them or they passed me. I saw my family a couple times, and gave them all a hug and/or a high five. And seeing (and hearing!) the JFT2 cheering section was a lot of fun. I actually heard them call my name this year at the finish line. Somehow I often don't hear that, although Theresa tells me they are calling my name. I guess my concentration is elsewhere! The end-of-race venue was good; they had pizza and fruit along with water and Gatorade. And way way back in my age group. Ouch! But this is par for the course (pardon the pun) given my low amount of training. Overall, as a "identify weaknesses" event there were no surprises and I found what I expected to find. I need to ride a lot more (especially hill training) to finish IMC with any kind of reasonable time. I need to get in more mid-week runs, and good steady open-water swims. The word of the day was "hot". Just about everyone remarked on how damn hot it was. I saw Jill Brandon at the start and we hung out a bit, calming our pre-race nerves. Jill and I discussed how it's never the actual race that makes us nervous, it's the worry that you forgot some critical piece of equipment... very OCD. I had a great swim. I drafted a bunch of people and came in 4 minutes faster than last year at 1:20. I start out with high hopes on the bike, given the low wind forecast. Well, that just wasn't true. The headwind was brutal, not because it was super strong but because it was strong and steady. Unrelenting is the word. On the back half of the first loop it was an amazing tailwind. I hit 34mph steady on the slight downhill, then steady 31 on the flats. I had an 18.2 mph average on the first loop, about the same as last year. The second loop was even tougher than the first going out, but a bit less of a tailwind coming back. The third loop had a lesser headwind, but by then my legs were starting to fade and my neck was killing me from the aero position. I was chafing, too, so I kept squirming around on the seat trying to find a better spot. And on the return, the wind faded way back, so I didn't get to enjoy a strong tailwind. I finished the bike in 6:33, about 22 minutes slower than last year. This is pretty much what I expected, since I knew I was coming into this undertrained on the bike. I was crossing my fingers for good conditions to make up for that, and didn't get it. The good news was that my nutrition plan of "fuel bottles" of water & Carbopro along with 1000mg of sodium every hour worked really well. I had no stomach problems at all on the bike, and except for exhausted legs I was fine. Thus I started the run hopeful for a 3:50 marathon and maybe a sub-12 finish. But alas, the heat did me in. I ran the first two miles, then started to get dizzy and had to walk an aid station. Then I ran maybe another mile, then walked a bit more. My stomach was a bit borderline, but I was trying to run as much as possible. I saw Jill, and I was confident this would be like IMAZ06 where I got stronger every loop. Somewhere around mile 9 I fell apart. I suddenly got very dizzy, and I felt very chilled - I had goosebumps on my arms, and that shouldn't happen in 92 degrees. I also felt very sleepy. I sat on a curb under a bridge (shade), head on my knees, waiting for that to pass. Several people asked if I needed help, which I declined, and of course I wanted to dodge the medical people because I didn't want an involuntary DNF. I wasn't all that bad, I thought, and that was proved true because after several minutes the dizzyness and chills were gone and I started moving again. After that I stopped using ice and sponges so much, and just ran most of the time at 10:30 to 11 minute pace. Pretty much as fast as I could go until my heart rate hit 150, which seemed to be when the dizziness would strike and I would have to walk a while. I also walked the few short hills on the course (climbs up to the bridge decks, mostly). The sun went down (finally!) at 6:57, and now I had an hour to run the last 7 miles or so for a sub-13 finish. But after some thought about my running pace, I figured I couldn't do the 30 seconds per mile faster that would take so I set my goal at a sub 5 hour marathon. Without the blazing sunshine, I pretty much ran the entire last loop, walking a few aid stations. I haven't checked my Garmin, but I think the pace was 9:45 or so. I came in with a 4:58 marathon and a 13:05 overall time. Overall, it was by far the toughest of the three Ironman races I've done. Last year was windier on the bike, but I was better trained and it wasn't as hot. The run last year and the year before were cakewalks compared to the run this year. According to weather.com, I ran all but the very last part of the marathon in the low 90s. Plus, nearly all my race time goals were going by unmet. Last year, I was on a PR pace in all three sports and overall time. It's a totally different mental game to be out there on the course suffering without those types of goals for motivation. You have to dig deep and really bring it to keep on running on a day like yesterday. I'm here in my hotel room with a brace on my ankle after RICE treatment since the race. I can't really walk much, but that's OK. I was having a great race until mile 18 or so, where I stepped on something in the road and wrenched my left ankle. I was so focused on execution and keeping pace by focusing on reeling in faster runners ahead of me I didn't even see what I hit. I think it was one of those reflector markers. Anyway I reached mile 20 right on schedule (2:33) but each mile after that was increasingly painful and slower. I hobbled in doing 9:30s or so for the last three miles at around 3:32 and went straight to the medical tent to ice it. I didn't think it was so bad, until I tried to stand up and nearly collapsed when I put weight on it. Even though I didn't hit 3:20, I'm putting this one in the "win" column, because I trained properly for the event, I had a proper race strategy that I executed well, and I managed to gut out a PR even with my bad ankle. If you've been following my blog, you know my goal is to BQ (Boston Qualify) at Sunday's Rock-n-Roll Arizona Marathon. There are about 10,000 marathoners and 25,000 half marathoners, so this should be quite a spectacle. My youngest daughter Lana is flying down with me for a mini-vacation, and to be my cheering section at the start and finish lines. My last marathon was back in October, and I did a terrible job following my race plan. I am fairly well trained, I think, for trying for a 3:20 in Arizona, but by no means is it in the bag. I am confident I can do it if I race smart, eat right, don't go too hard too early, and nothing out of the ordinary happens. Miles 6 – 13.1 (halfway): Run at 7:40 per mile. RPE should be a notch up, but not hard. Time to the halfway point: 1:40:40 or so. Miles 13.1 – 23: up to 175. Run at 7:35 per mile. Again, a little higher up the RPE scale, and I expect my HR to start to rise around mile 17. My long training runs showed a steady HR for the first 17 miles, then an upward climb after that. In my past marathons, mile 18 to 22 have been where the trouble starts so I need to run this part smart and steady. I should see the 18 mile mark at 2:18, and the 23 mile mark at 2:56. Then to the end: Run at 7:30 per mile or faster. This is where I need to kick it to ensure a sub 3:20 at the finish line. Nutrition Gu gels, my on-board fluids, and on-course water and energy drinks. I’ll have some Endurolytes along that I’ll take in the morning and at the 10 mile point. I'll use my Amphipod RunLite Trail Endurance that worked well in Portland, and I'll load it with 6 gels, a snack bar, and 21 oz of a Carbo-Pro / Gatorade mix. I'd have a gel at 15 minutes then every 45 minutes, and half a bottle of at 5, 10, 13.1, and 18 miles, with water on the course to dilute. I think I weighed myself down with too many varied foods in Portland (I had some slight discomfort the last few miles), so I'm going to drop the candy and just go with some bars and organic cereal for about 400 calories in the morning. I also have to make sure to jog the water stops. Looking at my Garmin during the Seattle half, I was surprised by how much my average pace dropped during a short 30 foot walk of an aid station and how long it took to get it back up. So there it is. Time to bring it on Sunday! I ran this back in November, the Sunday after Thanksgiving. Like Portland, This was a test race on my path to the Rock 'N' Roll Arizona Marathon in less than two weeks. The race starts in front of EMP; I arrived at the starting line just 2 minutes before the race start. We got stuck in traffic and I had to abandon my wife and daughter and jog to the start while they parked. My race plan was simple: start the first mile in the 150s, then mile 2-5 around 170. After mile 5, I’d keep it steady at 180, then mile 10 onward as hard as I could. I came in with 1:40:40, which is disappointing in light of the 1:34 pace needed to say I was “on track” for a 3:20 in Arizona in January. I’m happy with race execution though – I paced it well although I also didn’t negative split. However, the big downhill at mile 1-2 gave me a fast 6:50 mile there, and then the hills in the back half added a couple minutes. It’s my first time to run the half on that course, and it’s true what they say – the Seattle half is “all the hard parts” of the Seattle full course. Mile 1-2 has the long downhill to I90 express lanes, mile 7-8 is the big climb on the route with 8-9 the downhill on that and another climb 9-10. I went and looked more closely at mile 9-10 because my time was just too slow for the hill I remember. It starts with an uphill that’s not too bad, but then gets crowded and twisty with poor pavement. I recall weaving through people and a couple times getting stuck a moment behind a clot of slower runners. The uphill accounts for maybe 20-30 seconds; but otherwise I think next time I’ll make sure to push through more aggressively. There were a number of people from JFT2 racing both the full and the half. I saw Mark and Shannon in front of EMP - amazingly even with thousands of people, we ended up right next to each other at the start. 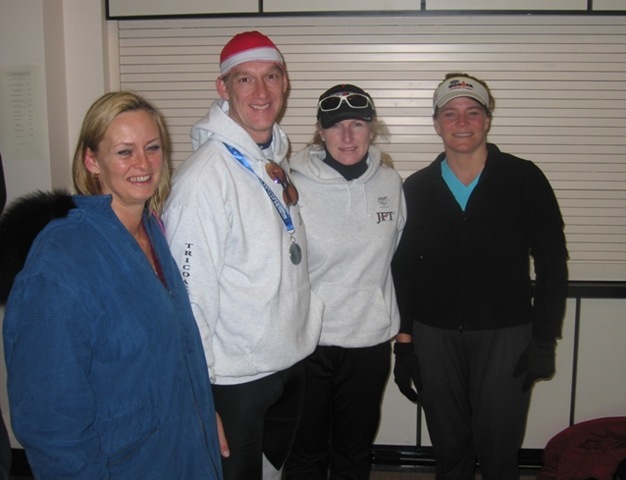 I saw Blake right after his run, but then had to wait a long time to meet up with Theresa and Lea. 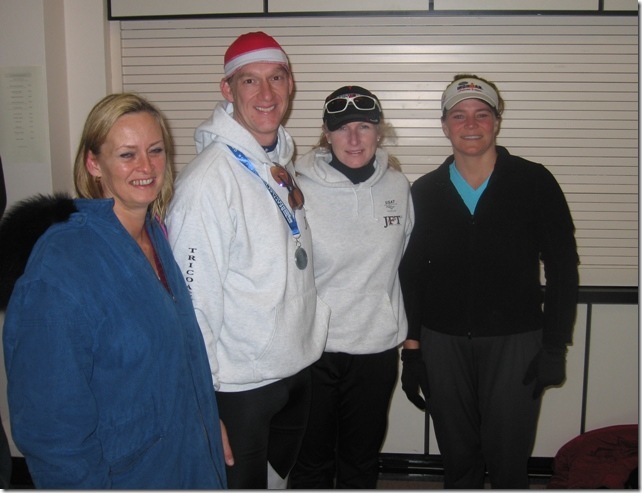 Theresa had already found Jill, so we went and found her and I shared my race report. Everyone on the team did pretty much what they expected without issues. David Treadwell was doing the full for a BQ, and nailed it with a 3:03! He encountered some cramps and had to stop and stretch a few times, otherwise he was on a sub-3 pace. That’s pretty impressive and something to aim toward myself. The picture to the left is about 90 minutes after race end. Theresa has her big puffy blue cold weather coat, and you see me in my red hat with the sides turned up. Quite Christmas-y, don't you think? And Coach Jill and Jill Brandon. Jill B also had a good run. These are the goals I've set for myself. Reach 50th percentile on the swim at IMAZ in April (I was bottom 30th last year). Sub 11 hour at IMC in August. Bike average 20mph or higher on one Ironman and at Lake Stevens 70.3 - without killing my run. Solid no-excuses performances at all of my events. And this is the plan for how to achieve my goals. Create a realistic Annual Training Plan with my coach and commit to meeting those hours each week (no excuses!). In 2007, there were several periods where I was off-plan for weeks at a time. Sometimes I had good reasons (work) other times not so much. Learn to effectively train and race with my powermeter. I'm know my race performances aren't nearly what I am capable of delivering, and this tool will help me reach that potential. Run more outdoors instead running on my treadmill. I didn't get into this sport to spend hours a week running in my garage watching DVDs, much as I enjoy combining two things I love together. I ran in the Portland Marathon last Sunday October 7th, for the second time and my sixth open marathon. I had a good race overall, I think, and I learned a lot (by hard experience) that I can use for in January when I run the Rock 'N' Roll Arizona Marathon. My goal in Arizona is to beat 3:20 and qualify for Boston, and I found out in Portland that it's not going to be easy to accomplish that. My time in Portland was 3:39, which is a PR but I was hoping for 3:35 - halfway to 3:20. And I failed to follow my race plan, which was the most disappointing for me. Theresa and I drove down on Saturday, visited my father and sister, then checked into the Benson. We wandered downtown for a bit, discovering that the famed Transit Mall is all but destroyed as it is being rebuilt for light rail. In middle and high school teenager I used to ride the bus everywhere and spent a lot of time on the Mall. It was strange to see it gone like that. I wanted to be finished with dinner by 6pm, so we headed to to the Macaroni Grill but discovered that dozens of other people had the same idea - a 2 hour wait. So we went to Alessandro's instead. They had immediate seating, but clearly didn't understand that marathoners eat early - they were badly understaffed for a fully packed dinning room at 6pm on a Saturday. So after a fairly lengthy wait, I had an excellent pasta dish, and Theresa enjoyed the saltimbocca. Start to Mile 5: target HR 150. It's hard to figure out pace-to-HR for a race, but maybe an 8:35. No higher HR than 155 bpm. I know that I warm up slowly, and I finish stronger on long runs if I take it easier the first five miles. So it’s critical for me to avoid starting too hard. Then to the end: flat out. Maybe mid to high 7s. Nutrition Mostly Gu gels and on-course water and energy drinks. I’ll have some Endurolytes along that I’ll take in the morning and at the 10 mile point. I purchased an Amphipod RunLite Trail Endurance at the Expo, and I loaded it with 8 gels, a snack bar, and 21 oz of a Carbo-Pro / Gatorade mix. I'd have a gel at 15 minutes then every 45 minutes, and half a bottle of at 5, 10, 15, and 20 miles, with water on the course to dilute. Also, I planned on eating a lot more beforehand. I awoke at 3:30 in the morning to eat 500 calories of 50/50 simple and complex carbs (bars, nuts, candy), then at 5:30 to eat some more complex carbs. I seeded myself just a ways back from the starting line, instead of with my pace group. I wanted to minimize the difference between the gun time and chip time, in case by some miracle I found myself already running a 3:20. This kind of back-of-my-mind thinking was already setting myself up for failure to follow my race plan, which you'll see in a minute. The gun went off and we were off! Here's the Garmin data for the run. In short, I blew my race plan pretty much entirely. I started too hard, ran strong in the middle, then faded at the end. First, I ran the first mile and a half way too fast. Yes, I was caught up in the excitement. My HR was 115 just standing there at the start. But more importantly, I looked at my Garmin and it said "9:30" and I thought, way too slow and I sped up what felt like a good amount. Then it said "8:50" and I thought "really?" and sped up a little more. Then I looked at it and it said "6:30" and I thought "OMG! I misread the 8:50 - it must have been 6:50". What a dope! Miles 2-5 felt good and I was letting lots of people pass me. But you can see that my HR was 10-15 bpm above plan, and my pace was 8:08 not 8:35 which would have been more sustainable. RPE was good, though, so it didn't feel wrong at the time. The weather was perfect - low 50s, high clouds, no rain. Miles 5-13 also felt good, but my HR was too high for my RPE so I went by RPE. My HR was around 170 or something - 10 higher than my plan. Well, I'm thinking this was a mistake and I should have ran 160 or so regardless of pace. Also there was a headwind after the turnaround at mile 9 or so, and I kept trying to draft people but I couldn't find anyone to pace. Mile 13-20 were tougher. I sped up again per plan and my HR was again about 10 higher than plan with RPE feeling right. In retrospect, this was the critical decision point of the race. I should have abandoned my negative split plan and aimed for a 1:50 for the second half. But I didn't, I just stayed on plan. At mile 13 beating 3:30 didn't feel impossible at all. I had no pains or problems with my legs and body, and I still felt strong. My nutrition plan was working fine. But by mile 17, I was starting to feel tired. And the hill just before mile 18 was tough - tougher than I recall from last year. My average dropped by like 25 seconds per mile, and I couldn't regain it. Mile 20-22 were a slog. My HR was high but RPE was dropping. My legs started to feel like lead. It was like my brain said "Faster" and my legs said "Nah, we don't feel like it". I just couldn't get the pace back up. I'm sure the faster first half was catching up to me! I took a fairly long break at the mile 21 aid station for a gel, some of my Carbo Pro mix, and two waters. Miles 22 to the end had a headwind most of the way, same as the wind after the turnaround. It was a slog, and I did manage to pick up the pace the last mile which was mostly downhill for a good finish. That food break at mile 21 kicked in about mile 24, and I felt a lot stronger. Just a few dozen yards from the finish line, I was coming up on a struggling runner and being passed by two faster runners. The struggling woman stumbled to the ground in exhaustion, and both of the faster runners stopped to scoop her up and help her get going again, sacrificing their own time. The crowd cheered mightily for this act of selfless good sportsmanship. Two women spectators, obviously friends of the woman, came to out to help so the two men could continue on. I was happy and surprised to see my brother Brian at the finish line. He has not been able to make it before, so that was cool. I felt good - no injuries on the run, no calf pain, no ITB, no shins. Back at the hotel, I spent 15 minutes in the tub, in the coldest water the faucet could make. Monday and Tuesday I felt beat up but in a good way - enough to know I had ran hard enough, but not injured. I went to my Master's swim class on Tuesday night, and that seemed to really help. I was totally back to normal Wednesday morning.